MEMORIES from this year’s trip to Bad Lippspringe in Germany were shared at the Newbridge Town twinning meeting held recently. This year’s annual general meeting was held in Ryston Social Club and outgoing chairman, Peter O’Neill was delighted to welcome the large attendance. Reports from the year were given by the chairman, secretary, treasurer and PRO. Mr O’Neill reflected upon the many highlights of 2018 both here and in Bad Lippspringe. In August 44 adults and children representing Newbridge and Leinster Academy of Dance travelled to Bad Lippspringe for the ‘Festival of Light’and this was described by Mr O’Neill as “one of the best experiences of the year”. “Indeed the dancers wowed the people with performances on the stage in the forest and then at the castle in the town. Children and parents returned with great memories of Bad Lippspringe and the welcome they received there,” he said. He thanked the committee for their hard work and commitment and thanked also Kildare Co Council and Kildare-Newbridge Municipal Authority for their support. Cllr Morgan McCabe was in attendance and he undertook to pass this on to the council. Secretary Karen Tyrell also mentioned the visit to Moorefield GAA Club in June and their hospitality to the visitors. She mentioned the welcme barbacue in Bad Lippspringe and how easy it proved for the children to settle in so well and perform. Treasurer Declan Browne presented his report and thanked the council and the municipal authority for their assistance. The elections followed; Claire Doyle was elected as president, Peter O Neill chairman, Karen Tyrell secretary, John Morrissey vice chairman, Declan Browne treasurer and committee Deirdre Hughes, Mary Doyle, Bill Mahon, Frank McCormack, Columba Feeney with others to be confirmed and co opted at first committee meeting. Cllr Morgan McCabe is the twinning liason officer for the council and he will also attend meetings. 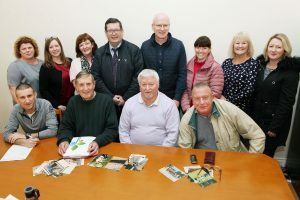 Under any other business the dates for 2019 were confirmed, 45 guests will arrive in Newbridge 27 April for five days and the Newbridge visit takes place from 9 – 12 August to be part of the ‘Light Festival’ again. “We are now encouraging people to travel for this festival and become twinning members,” said Mr O’Neill. For further information contact Peter O’Neill on 087 2422380 and watch out for twinning details on Facebook.